In tropical and subtropical granite regions, quantities of boulders were encountered by the tunnel boring machine (TBM) threatening construction safety. The detection of potential boulders in the driving path of a TBM before construction begins in this region has always been a critical issue. However, boulder detection seems to be aimless owing to a lack of recognition of the boulder distribution law. In this study, the process by which boulders form and evolve is analyzed on the basis of the weathering mechanism of the strata. From this, a general law is hypothesized: on the vertical axis, boulder frequency decreases exponentially with increasing of vertical distance from the bedrock. Data from the literature prove the reasonability of this hypothesis. 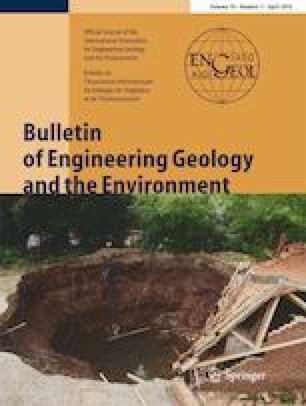 Subsequently, on the basis of this law, a simple approach for forecasting high-probability zones of boulder occurrence in TBM tunnel engineering was proposed, which was then applied to two newly built tunnels. The field data showed that all boulders were spotted in the forecasted high-probability zones, which verifies the effectiveness of this approach. Significant cost-savings will occur when more boreholes or geophysical prospecting are used in the forecasted high-probability zones rather than all over the tunnel line aimlessly. The study was supported by National Key R&D Program of China (Grant No. 2017YFB1201204) and Natural Science Foundation of China (Grant No. 41472247), and these financial support are greatly appreciated.